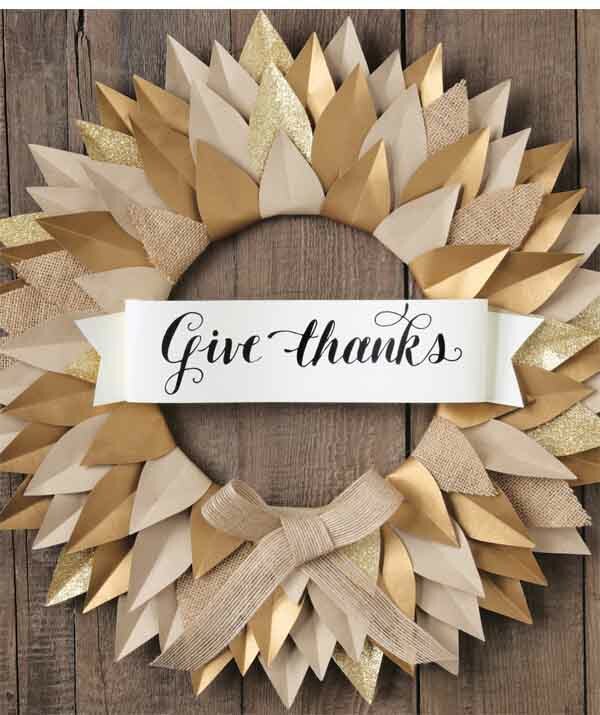 Download the Give Thanks Banner PDF and print onto 8 1/2″ x 11″ Superfine Softwhite Text. Cut out banner and ribbon tail strips along the dotted line. Fold sides of banner back approximately 1″ on each side and adhere in place with a foam square. Cut ribbon tail piece in half and position pieces as desired on each end, securing to the back of the banner using foam squares. Using more foam squares, adhere finished banner in place on your wreath, or use as part of your Thanksgiving décor. So pretty! Thanks for sharing! Did someone write this or is it a font? How did you make the wreath? The wreath is our Burlap Wreath Kit which has step by step instructions on how to assemble included with the product. Although it’s out of stock online (http://www.papersource.com/item/Burlap-Wreath-Kit/4071295670.html) you might be able to find it in stores!